1 First, you have to love to love the word of God and enjoying studying the Bible. And I mean LOVE studying! For every 30 minutes I spend teaching, I spend 12-15 hours in Bible study and preparation. It helps if you enjoy public speaking, but in terms of time spent, the private study far outweighs the public speaking. Fortunately bible study is an acquired taste! The more you learn, the more it tastes like honey. You don’t need to go to seminary, but you do need a voracious appetite for studying and the ability to learn independently. 2 Second, be warned that Bible teaching is a lonely calling. You spend a great deal of time alone with your books. If you’re gregarious by nature, you may find teaching a hard road. If you’re attracted by the glory of being up front or the appeal of others looking up to you, re-read the book of Jeremiah. Almost all teaching offends someone. Declare what you believe in front of others and you will take criticism. Theology by its very nature is divisive. Saying you believe A is true means B is false. Your friends who believe B may choose not to remain friends. As you grow in discernment and wisdom, it is really tempting to inappropriately judge your friends with your new found knowledge (see #3). 3 Finally, realize that being right does not make you righteous. Hours of prayerful, humble Bible study will pay off in wisdom, knowledge and discernment. You may win all the arguments with your friends because you’re just plain right, but you’ll still be a sinner in need of God’s grace. It still takes the work of the Holy Spirit in your humble contrite heart to bring about lasting genuine change. Basics of Bible Interpretation, by Bob Smith – a classic! great for the beginner. Now available FREE online, though I believe you can still buy a paper copy. Living by the Book, (Book and Workbook) by Howard G Hendricks & William Hendricks – also available as an ebook and a video series. Don’t be intimidated by the size of the book. The writing is clear and engaging and you will learn a lot. The Joy of Discovery in Bible Study, by Oletta Ward – a classic resource for small groups to work through together; teachers guide is also available. This book is great for beginners. The Language of God: A Commonsense Approach to Understanding and Applying the Bible, by Ron Julian, J.A. Crabtree and David Crabtree — this is a GREAT book for understanding the principles, methodology and philosophy of Bible study. I highly recommend it. How to Read the Bible for All It’s Worth, by Gordon Fee & Douglas Stuart – this is a must have resource; no Bible student should be without and it now comes as an e-book. Re-read the chapter for your particular type of passage when you start a new study. Invest in good study software. There are several good ones. My favorite is E-Sword and its sister site BibleSupport.com E-sword is free (though I encourage you to make a donation if you become a regular user) and it does everything. As you improve your study skills, find a great Bible teacher and attach yourself to him/her. In fact find a few. Even if you can’t formally mentor with your chosen teacher, attend every time she speaks and study both her content and her presentation. Notice how he organizes the material, how he matches application to the audience and especially how he arrives at his conclusions. Thanks to the internet, you can “study under” many teachers online without ever meeting face-to-face. I haven’t seen some of my mentors in 20 years, but I rarely miss their teaching. If you can formally mentor with a teacher, pick a passage with the goal of teaching it and then practice teach it to your mentor. Or find a small group who is willing to give you honest feedback. Then be willing to listen to it. Foundations: An Overview of Systematic Theology (DVD series) by RC Sproul; This is a DVD series of 60 23-minute lessons; the small time chunks make it easy to fit into busy schedules. You can buy the DVD or sign up to take it as a course online with a study guide. Study. Practice. Teach. Repeat. 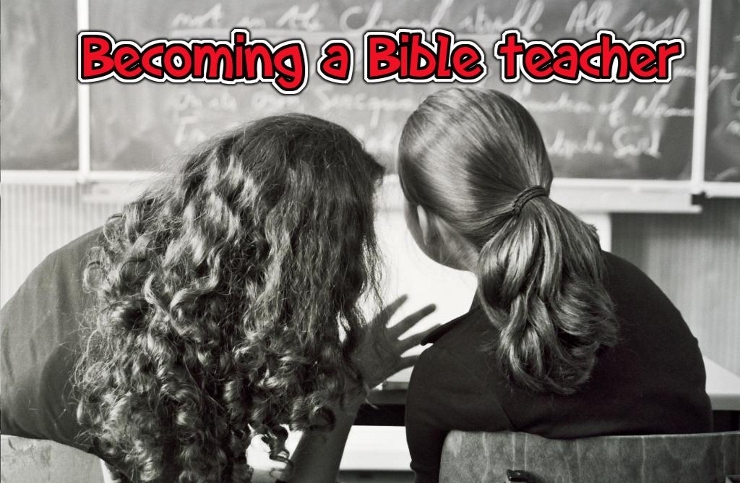 Before you know it you’ll be a Bible teacher.